The last two days all my symptoms are gone except tender breasts and tiredness. No nausea, no food aversions or cravings. Can't wait till my first gynae appointment on the 23rd (12 more days!) to know if everything is alright. However, I am feeling tight around the band of my bra that seems to bring back the indigestion feeling. I am able to be bra-less when I am at home, but obviously have to wear them to work. There are times when I feel it's choking me a bit and I have to unhook them at work. Will have to see what options I have this weekend. Health-wise, I have been eating a lot more fruits, drinking more water, and in the office drinking rooibos tea + ginger + honey. Don't think I was ever this healthy my entire life. Plus the fact that I have been sleeping early the past few days, around 8.30-9.00pm I'm already exhausted. The cold weather at 16 degrees Celcius also make me feel like crawling under the blanket. Even hubby is exhausted (He's pregnant with me!) and sleeps early with me. I went for a little shopping spree yesterday afternoon. Bought these 2 books at Exclusive Books. 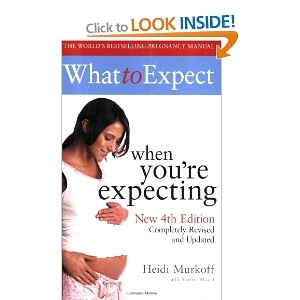 I know the "What to Expect when you're expecting" is the more famous one, but I am actually enjoying "The Day-By-Day Pregnancy Book" so much more. Very comprehensive and give other details besides the usual day-by-day what is happening to your body. I shall read it for the next few months and write a review of them then!